South ended North's winning streak last week, while the Eagles continued their losing streak against Norwood. 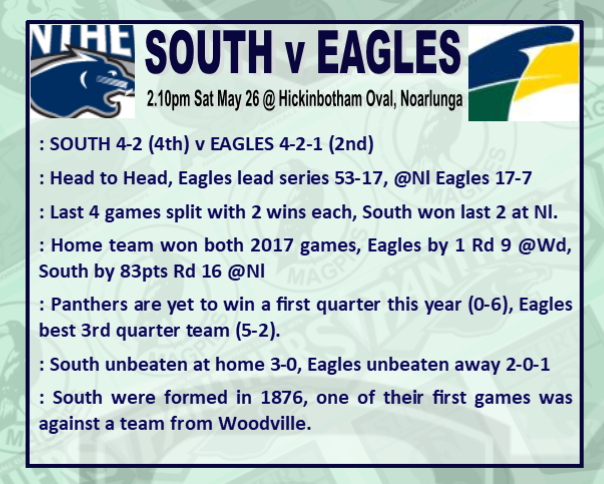 Will South keep their good form going at home, or will the Eagles bounce back? The Eagles have made three forced changes for their contest against South on Saturday. AFL draft prospect Jack Lukosius is unavailable due to McDonald’s SA Under-18 team selection while ruckman Jordan West (knee) and midfielder Jack Firns (shoulder) have succumbed to injury. First-choice ruck Marc Borholm returns to the 21-man line-up while Magpies recruit Tom Gray and utility Jackson Lee are both named on the interchange bench. McLeod, Cook, Hawkins, Rowe, Minney, Weidemann, Comitogianni, Schmusch, X.Redden, Martin, C. Gaffney, Miller, Moore, Guilhaus, Heinjus, W. McPherson, Petrenko, Woods, Smith, Wehr, Sibley. On paper you would have to say the Eagles but I have a hunch that South might sneak a close win here. For some reason WWT aren't gelling this year and if South reproduce what they showed against North they will come home with the choccys. UncleHuey wrote: On paper you would have to say the Eagles but I have a hunch that South might sneak a close win here. For some reason WWT aren't gelling this year and if South reproduce what they showed against North they will come home with the choccys. Or if you look at the 2018 record North did to the Eagles what Norwood did . But the game between those two was Sturt . For some reason the eagles managed to beat the reigning premier but couldn't gell against North and Norwood . You could he right uncle Huey but I hope your not . Panthers to continue their excellent record at home in the last 3 years and win this one by 21 pts. Reverse helicopter kick that went straight . Was a game winner . Some Eagles players put in the hard tackles bumps that seemed to rattle South. It's Sunday before I head out. I'll be honest here by half time I was thinking I'll be leaving at 3/4 tune . Not sure what Gods said at 1/2 time the Eagles may have gelled . Or they took some angry pills same players different attitude . Whatever it was it stopped an all fast running South in their tracks . I for one wouldn't want to take a hip and shoulder from Sharrad let alone a Redden tsckle. Sounds like the "pull the finger out" half time blast was effective. UncleHuey wrote: Sounds like the "pull the finger out" half time blast was effective.